During the pause from the breaking of seals, the four angels standing at the four corners of the earth are introduced. Responsible for harming the earth, they await the sounding of the first four trumpets; however, they are instructed not to harm the earth until the bond servants of God have been sealed on their foreheads (Rev 7:1-3). The bond servants are sealed the names of Jesus and Yahweh written on their foreheads (Rev 14:1). This sealing is very different from the Holy Spirit’s sealing of a new genuine Believer (2 Cor 1:21-22; Eph 1:13-14). The "seal of God" protects the bond servants from the woe of the fifth trumpet (Rev 9:4) – the plague of stinging locusts from the bottomless pit that tormented people with pain for five months. The sealed bond servants number 144,000 from every tribe "of the sons of Israel." (Rev 7:4). They are virgin Jewish men who "follow Jesus wherever He goes" (Rev 14:4). 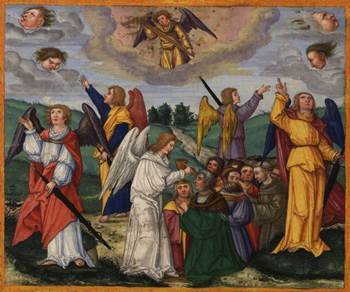 The time it took to seal the 144,000 appears to be the reason for the thirty minutes of silence in heaven that follows breaking of the seventh seal (Rev 8:1-2). Subsequent to this first interlude, after the seventh trumpet and before the first bowl, the apostle John sees Jesus Christ with the 144,000 sealed bond servants "who had been purchased from the earth" (Rev 14:3-4), which indicates that they were dead and in heaven. They were privileged to sing a new song before God, the twenty four elders and the four living creatures that no other saint could learn (Rev 14:3). They were blameless and incapable of telling a lie (Rev 14:5), which implies a reference to what they may have been like while on earth as mortal human beings. Thus, the trumpet judgments did not begin until the 144,000 bond servants were sealed, and by the seventh trumpet, they were no longer alive on earth.